When night fell, what was it like atop Mt. Pulag? In near total darkness we followed a seemingly endless trail, winding up and down, around slope after slope, before finally sliding down a steep trail towards the dreaded Camp 3. We didn't expect to trek past nightfall, but here we were, weary and hungry, with only our headlamps and a well worn trail coaxing us on. Visibility was barely beyond my feet, thanks to the bone-chilling fog that enveloped us after the sun set. We are in the middle of nowhere. I remember asking myself... what are you doing here Bobby? At camp, our tents stood waiting. 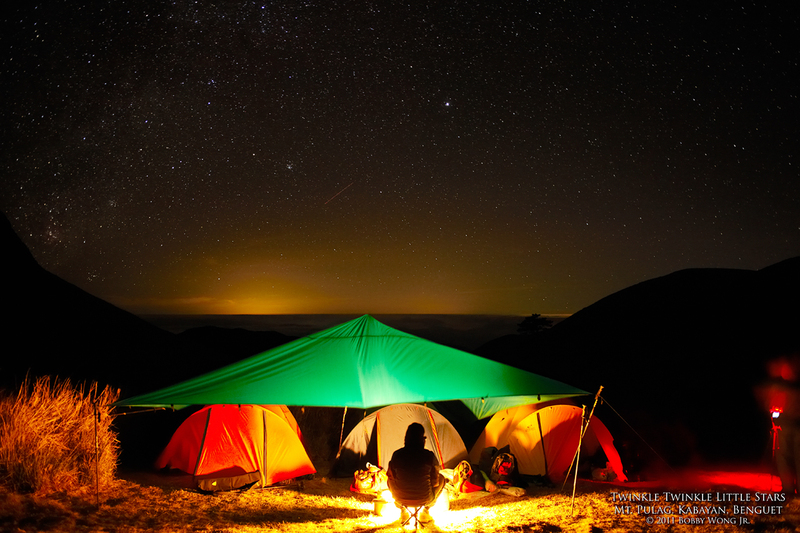 After a cup of hot soup, some crackers, and light banter around our camp-stove, we were ready to hit the sack... until the fog suddenly lifted to reveal a sky peppered with an endless sea of stars. I stood there staring out in all directions, as far as my eyes could see, stunned that so much of the heavens above were hidden by light pollution back home. And the thick band of stars on the left-hand side of the photograph? That's the direction towards the center of the Milky Way, our own galaxy! If there was a priceless moment in the whole trip, this was it. Enjoy. this is just WOW! Great technique. We hardly get a view of this in Manila. Great photos! I love them. I've been wanting to get a print of them but Mr. Murillo hasn't replied yet. Maybe you know of an alternative place to get them (if they're printed already) or an alternative contact for Mr. Murillo. Thanks a lot.